The acoustic bass guitar (sometimes shortened to acoustic bass or initialized ABG) is a bass instrument with a hollow wooden body similar to, though usually larger than a steel-string acoustic guitar. Like the traditional electric bass guitar and the double bass, the acoustic bass guitar commonly has four strings, which are normally tuned E-A-D-G, an octave below the lowest four strings of the 6-string guitar, which is the same tuning pitch as an electric bass guitar. Because it can sometimes be difficult to hear an acoustic bass guitar without an amplifier, even in settings with other acoustic instruments, most acoustic basses have pickups, either magnetic or piezoelectric or both, so that they can be amplified with a bass amp. 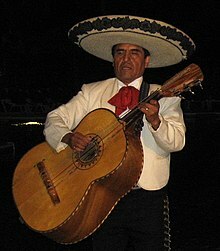 Traditional music of Mexico features several varieties of acoustic bass guitars, such as the guitarrón, a very large, deep-bodied Mexican 6-string acoustic bass guitar played in Mariachi bands, the león, plucked with a pick, and the bajo sexto, with six pairs of strings. The first modern acoustic bass guitar was developed in the mid-1950s by Kay of Chicago Harpone started producing their B4 model in 1965 under the name Supreme. In 1967 Harptone started producing the B4 under their name production ended in 1975. Note. They also made a very limited number under the Standel logo. Ernie Ball of San Luis Obispo, California, began producing a model in the early 70's. Ball's aim was to provide bass guitarists with a more acoustic-sounding instrument that would match better with the sound of acoustic guitars. Ball stated that "...if there were electric bass guitars to go with electric guitars then you ought to have acoustic basses to go with acoustic guitars." Ball notes that "...the closest thing to an acoustic bass was the Mexican guitarron...in mariachi bands, so I bought one down in Tijuana and tinkered with it." Ball collaborated with George Fullerton, a former employee at Fender, to develop the Earthwood acoustic bass guitar, which was introduced in 1972. Production of this instrument ceased in 1974, resuming a few years later under the direction of Ernie Ball's employee Dan Norton, until production finally ended again in 1985. The Earthwood acoustic bass guitar was quite large (and deep) in contrast to most instruments in current production, which gave it more volume, especially in the low register.photo 1photo 2photo 3 The Ernie Ball company describes Ball's design as "an idea before its time"; the instrument was little used in acoustic musical performances until the late 1980s, when the acoustic basses were used in performances on the MTV Unplugged television program. The Earthwood was quickly supplanted by the Washburn AB-40 designed by Mick Donner and Richard Siegle. The AB-40 and the more affordable AB-20 became the instrument of choice for bass players appearing on Unplugged. Folk bass player Ashley Hutchings used the acoustic bass guitar with his Etchingham Steam Band in 1974 and 1975. An early user of the acoustic bass guitar in rock was English multi-instrumentalist and composer Mike Oldfield, who had one custom-built for him by luthier Tony Zemaitis in the mid-1970s. Mike used the bass on a number of his recordings from that time onwards, a prominent example being his 1975 album Ommadawn. Brian Ritchie of Violent Femmes was also an early user of acoustic bass guitars. Unlike the electric bass guitar, which is generally a solid body instrument, the acoustic bass guitar usually has a hollow wooden body similar to (though usually somewhat larger than) that of the steel-string acoustic guitar. The majority of acoustic basses are fretted, but a significant number are fretless instead. Semi-fretted versions also exist, although they are quite rare. Like the traditional electric bass and the double bass, the acoustic bass guitar commonly has four strings, which are normally tuned E-A-D-G, an octave below the lowest four strings of the 6-string guitar. Like the electric bass guitar, models with five or more strings have been produced, although these are less common. In part, this is because the body of an acoustic bass guitar is too small to produce a resonance of acceptable volume at lower pitches on the low "B" string. One solution uses the five string acoustic bass to add an additional high string ("E-A-D-G-C") instead of adding a low "B". Another solution is to rely on amplification to reproduce the low "B" string's notes. There are also semi-acoustic models, fitted with pickups, for use with an amplifier. The soundbox of these instruments is not large enough to amplify the sound. Instead, it produces a distinctive tone when amplified, similarly to semi-acoustic electric guitars. Thin-body semi-acoustic basses such as the violin-shaped Höfner made famous by the early Beatles and several Fender models are not normally regarded as acoustic basses at all, but rather as hollow-bodied bass guitars. There are also semi-acoustic basses such as Godin Guitars' "A-Series" that, once amplified, sound much closer between acoustic bass guitars and upright basses (double bass), and have been used in professional circles to "simulate" one when it would be impractical for transportation and other reasons to use a full-sized upright bass. As with semi-acoustic electric guitars, the line between acoustic instruments fitted with pickups and electric instruments with tone-enhancing bodies is sometimes hard to draw, especially when some instruments can also be equipped with a variety of pickups such as piezo pickups, the "standard" of acoustic-electric instruments as well as synth pickups that can replay "virtual" upright bass sounds and bring a semi-acoustic bass much closer to a double bass sonically. Saga Musical Instruments produces a four-string bass resonator guitar under their Regal brand name.videos National Reso-Phonic Guitars also produce three models of resonator bass guitar. Other manufacturers of acoustic bass guitars (not mentioned above) include Alvarez, Ibanez, Boulder Creek Guitars, Breedlove, Chesbro Music Company (Teton Guitars), Cort, Crafter, Jerzey, Dean, Eko, Epiphone, Eston, Furch, Guild, Washburn, Maton, Ovation and its subsidiary Applause, Michael Kelly, Prestige, Ribbecke Halfling Bass, Sunlite, Takamine, Tacoma, Tanglewood, Taylor, Larrivée, Lindo Guitars, Warwick, Fender, Gibson and Martin. The guitarrón is a very large, deep-bodied Mexican 6-string acoustic bass guitar played in Mariachi bands. Other Latin American acoustic bass guitars exist as well, see: Bordonua. ^ Bassie (25 November 2017). "Geschiedenis van de basgitaar: van 1936 tot heden". Basgitaar (in Dutch). Retrieved 8 March 2018. ^ "The Etchingham Steam Band". mainlynorfolk.info.